David Francis Taylor does not work for, consult, own shares in or receive funding from any company or organization that would benefit from this article, and has disclosed no relevant affiliations beyond their academic appointment. With claims and accusations flying left, right and centre during the election period, many of us are looking to cartoonists for much needed daily doses of satire – and sanity. Political cartoons have been a vital part of British political culture for a good 300 years, and it’s striking how often they make sense of the inevitable tangle of issues, interests and personalities by alluding to well-known characters and scenes from literature. Just last week a cartoon by Peter Schrank cast Ed Miliband and Nicola Sturgeon as the “star-cross’d lovers” of Shakespeare’s Romeo and Juliet. In a parody of the famous balcony scene, Sturgeon leans from the balcony of her Scottish castle to address Miliband, who stands below proffering a bouquet of flowers in one hand and a Trident missile in the other. Unimpressed, Sturgeon points to the weapon and tells Miliband: “You dinnae come anywhere near me with that thing.” The cartoon turns Shakespeare’s drama on its head. A tragedy of passion and illicit love becomes a comedy of awkward political courtship. Miliband, in need of a partner, is but a poor Romeo. Sturgeon, meanwhile, is certainly no pining Juliet. Through this use of Hamlet Schrank calls up the whole drama of indecision and – presuming we know how the play ends – gestures towards the damaging political consequences that will attend such paralysis of action. Indeed, so effective is this allusion as a satirical strategy that Schrank repeated it in 2013, when he depicted Barack Obama as Hamlet as a means of scolding him for his failure to act decisively in Syria. Literature brings to the messy, sometimes senseless world of politics a narrative structure (and often a moral one too) with which we – the readers, the voters – can engage. This use of canonical texts, what we tend to call “classics”, isn’t new. Cartoonists have been turning to our favourite books for material since the 18th century. And certain texts become political myths. Works such as Hamlet, Macbeth, Paradise Lost, and Gulliver’s Travels are now ingrained in the way we think and talk about parliamentary politics. Frankenstein remains an especially popular text with satirists. In 2012, a cartoon by Scott Clissold showed David Cameron, in the role of Victor Frankenstein, triumphantly exclaiming “It’s alive!” as his monster, “Economic Recovery”, awakens on the operating table. Revival, Clissold seems to be suggesting, has been achieved by unnatural means. Rather than breathing new life into the nation’s economy, the government has merely reanimated dead matter. And a cartoon of 1996 takes up the same scene to make a different point. In Richard Willson’s “Dr. Mandelstein’s Monster” Tony Blair, then a fresh-faced leader of the opposition, is depicted as the diabolical creation of a devious Peter Mandelson. Here, the story is one of political puppetry. These cartoons testify to Frankenstein’s enduring power as a modern cautionary tale. But they also reveal how a text’s elevation to the status of cultural myth often uncouples its characters and narrative from their original iteration. Clissold and Willson take up the iconic scene of James Whale’s 1931 film but it doesn’t appear in Mary Shelley’s 1818 novel. There, Victor’s reaction to the Creature’s awakening is one of horror, not triumph. Physically disgusted by his work, he runs from the room. Much closer to Shelley’s novel is 19th-century cartoonist John Doyle’s “A New Illustration of the Story of Frankenstein!” of 1843. Doyle depicts Irish nationalist leader Daniel O’Connell as Frankenstein. O’Connell flees in alarm from the monster of his own creation, the demonic personification of a radical politics that has got out of control. “I have been your slave long enough”, the Creature insists. But sometimes we would do well to treat such narratives with caution. The use of Macbeth is a case in point. In 1821 the cartoonist Theodore Lane imagined Queen Caroline, the estranged wife of George IV, as Lady Macbeth. 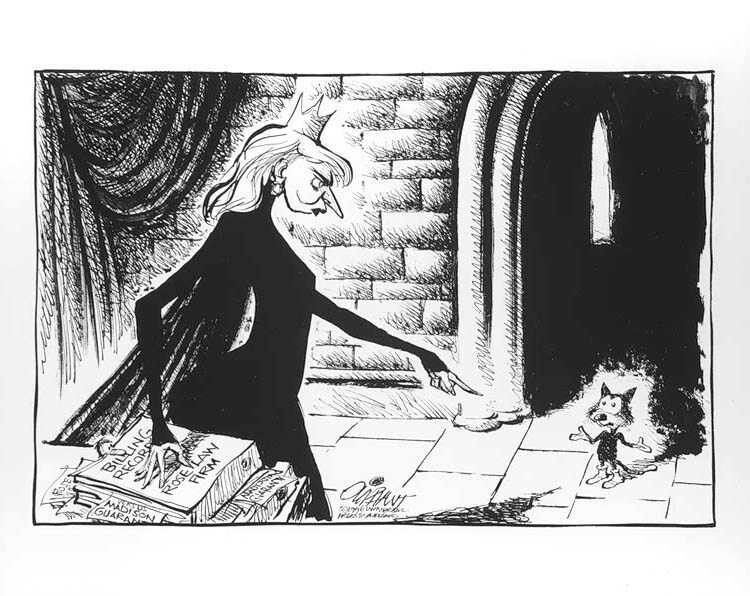 In a parody of Act 5 Scene 1, his cartoon shows a sleepwalking Caroline revealing her troubled, guilty conscience to the nation. The King and government accused the Queen of serial infidelity and Lane rather unsubtly suggests this “brazen” nature by placing her before the shopfront of a “Wholesale Dealers in Brass”. Lane hammers his point home by doubling the Shakespearean reference. While Caroline exclaims “Out damned spots”, John Bull, personification of England, tells the Queen: “To a nunnery go!” (quoting Hamlet 3.1). Lane may also conjure Ophelia – another of Shakespeare’s “mad” women – here, but his satirical jibe hinges on the figure of Lady Macbeth. His cartoon established the character as the image of the political woman. And this image is far from a pleasant one. Margaret Thatcher and, more recently, Hillary Clinton and Cherie Blair have all been cast in the same role. The implication, of course, is not just that these women are dangerously ruthless but that they have willingly “unsexed” themselves, jettisoned their femininity, in pursuit of power. The way these images demonise public women is incredibly uncomfortable – surely there are other, better ways of representing them? As in the 18th and 19th centuries, today’s political cartoons use literary works to plot complex political problems and policies. But we need to remain critically alert to how these narratives are being appropriated and transformed – to the structures and values they impose on events and people.